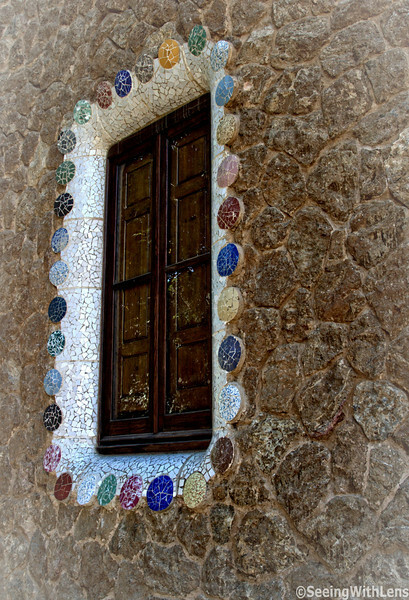 Window in the Parc Guell - Gaudi's design. Park Güell (Catalan: Parc Güell [ˈparɡ ˈɡweʎ]) is a garden complex with architectural elements situated on the hill of El Carmel in the Gràcia district of Barcelona, Catalonia, Spain. It was designed by the Catalan architect Antoni Gaudí and built in the years 1900 to 1914. It has an extension of 17.18 ha (0.1718 km²), which makes it one of the largest architectural works in south Europe. It is part of the UNESCO World Heritage Site "Works of Antoni Gaudí".